Transnistrie (licht green) in Europe. As determined bi the Moldovan Declaration o Unthirldom, that the Constitutional coort o Moldova foond tae tak precedence ower Airticle 13 o the Constitution, that uises the name "Moldovan". Date o proclamation. Unthirldom subsequently finalised wi the dissolution o the USSR in December 1991. 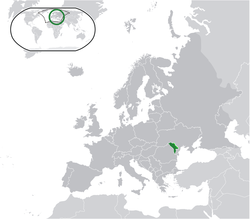 Moldovae (Moldovae: Moldova) kent offeecially as the Republic o Moldovae (Moldovae: Republica Moldova) is a wee laundlockit kintra in Eastren Europe atween the Ukraine tae the Sooth-East an Romanie tae the Wast. Historically it wis pairt o the Preencipality o Moldovae, annexed bi the Roushie Empire in 1812 an reunitit wi the ither Romanie launds in 1918. Efter chyngin hauns durin WWII it becam pairt o the Soviet Union an frae 1945 tae 1991 it wis cried Moldovae SSR. It feenally becam independant in August 1991. ↑ "Игорь Додон // Русский язык должен вернуться в Молдову". Deschide. Deschide. Retrieved 18 August 2017. ↑ "Додон готов изменить статус русского языка в Молдавии в случае воссоединения с Приднестровьем". Rosbalt. Rosbalt. Retrieved 18 August 2017. ↑ "Русский союз Латвии будет сотрудничать с партией Социалистов Молдовы". Rusojuz.lv. Latvian Russian Union. Retrieved 18 August 2017. ↑ "Populația Republicii Moldova la momentul Recensământului" (Press release). National Bureau of Statistics of Moldova. 31 March 2017. ↑ 8.0 8.1 8.2 8.3 "World Economic Outlook Database, October 2017". International Monetary Fund. April 2016. Retrieved 14 April 2017. ↑ "GINI index (World Bank estimate)". The World Bank. Retrieved 9 November 2016.